Headlines:The Reports have been far better this week with some nicer weather and a few more anglers getting out and having a go. 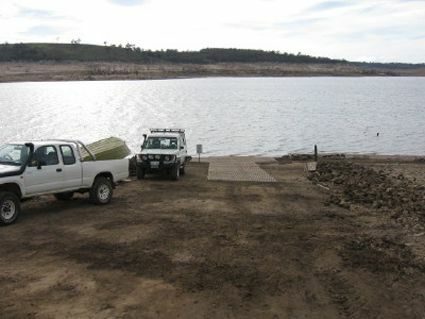 Eucumbene has produced good numbers and Jindabyne some really good quality fish. Lake Jindabyne:- Some nice fish have been caught in Jindabyne on the rough overcast days and a few on bright still days but the polaroiding has not really started yet. There are big numbers of fish in the Thredbo at present and these will drop back to the lake in the coming weeks and cruise the edges looking for a feed. 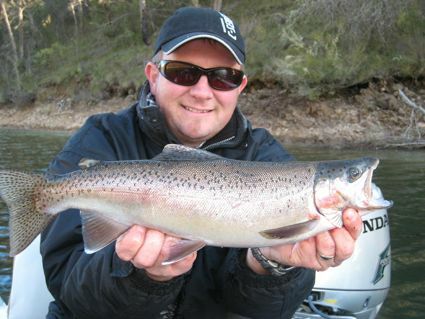 *John Fisher from Canberra managed a 55cm Rainbow on a Woolly Bugger in terrible conditions. The fish went like a freight train and fought like a much larger fish. 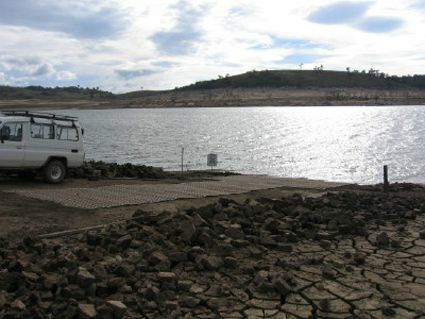 Fished <?xml:namespace prefix = st1 ns = "urn:schemas-microsoft-com:office:smarttags" />Hatchery Bay in Jindabyne Wednesday 11/7 from midday onwards. Polaroided from the bank at first but not many fish to cast at even though the conditions (weather wise) were ideal. I decided to make the most of the calm conditions and went out in a float tube boat to try some deeper water. Switched to an intermediate line with a sinking tippet and tried a combination of casting and slow trolling flies over the weed beds and around any submerged rocks or other structure I could see. All was quiet till about 4.00pm when I managed a couple of good rainbows in quick succession and lost another. 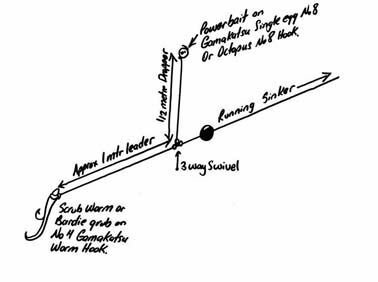 All were hooked fairly close to shore but you needed to be deep enough and over the weed beds which is where the fish seemed to be holding. Best fly was a black woolly bugger with green sparkle/flash in the tail. Trolling and Spinning have produced mixed results with some anglers cleaning up and others struggling. Spinningwith soft plastics has been awesome. 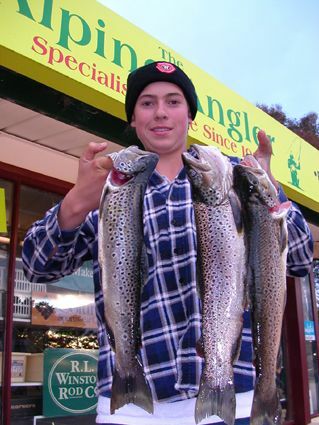 *Shane and Brenton Kelly threw Squidgies around the Grace Lea/Tollbar area and landed 30+ fish in two days fishing. They also missed just as many strikes and had fish taking the lures in full view right next to the boat. A mixture of Browns and Rainbows were caught with the largest in the 50cm range. Best lure was Rainbow Trout Squidgies in 60mm fish, fished with a steady slow retrieve. Below: Shane Kelly with part of the catch. *Brad from Khancoban and Luke from Yarrawonga trolled up four good Rainbows and two good Browns near the Dam wall on the weekend. Tassies and Minnows worked very well. 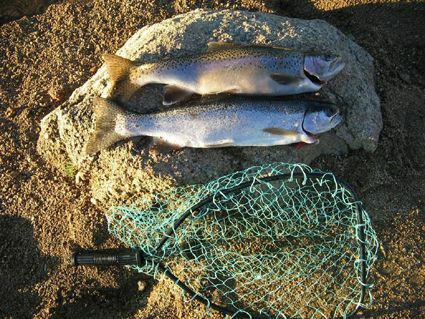 They also caught some nice fish at Jindabyne as well.